My commission process has been getting much smoother. I delivered one commission from a prior show at Origins. That was quite exciting. One additional new thing that I am doing with the commissions is including a lenticular print of the character in an animated pose. I delivered the first of these with the commission at the beginning of the show, and my customer loved it. 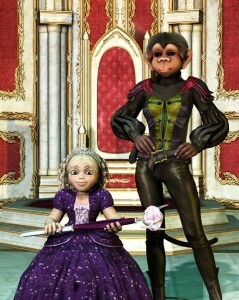 The character is Princess Sparkleshine (a dwarf princess) and her companion and caretaker, Zanya. I also got one character commission during the show, and that was exciting, too. There are few experiences more enjoyable at a convention than bringing a customer in for the final review of their character, and seeing their faces light up. I think they are often pleasantly surprised that I can do full color work at the same price that others charge for a black and white sketch. Also, since most of my time is spent on creating the character model, it doesn’t take much pose the model in multiple positions for the customer. This gives the customers more of what they want, and provides me an opportunity to differentiate my work from other artists. I can’t sell original copies of my work because all of my work is digital, so I have to squeeze as much out of the medium as possible. Commissions, stereoscopic images, and multiple character images make that possible. I tried out some new things at the booth this year, including post cards, small magnets, and smaller variance in the price points. These taught me some hard lessons. The sales were OK, though I noticed on a few occasions that interactions that would have normally lead to the sale of a $10 print instead lead to the sale of a $1 postcard. Though I sold more items, I wouldn’t have matched last year’s dollar figure if I hadn’t received a character commission late in the weekend. This is something that I am going to have to figure out how to reconcile. This was a great experience. Hopefully, I will remember to look back on these last three posts before GenCon and the next Origins.